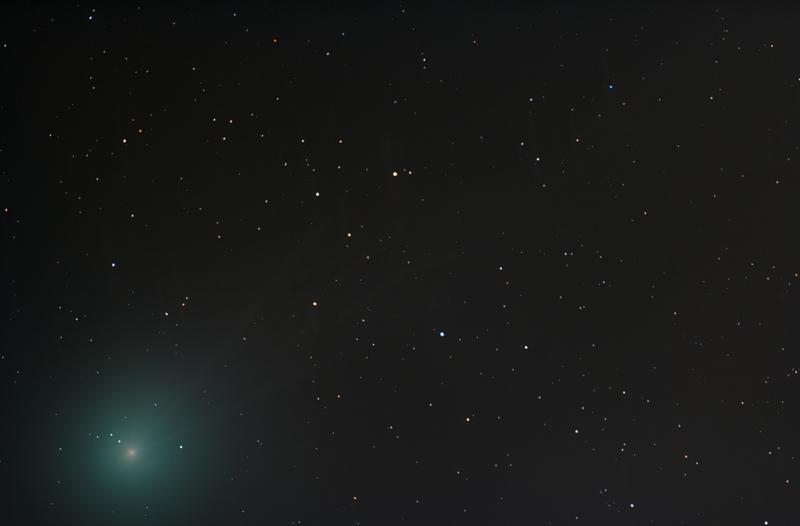 Here is the result of a second urban imaging session on the comet. The transparency was poor and the comet positioned in the worst of the light pollution at my urban location so I decided to concentrate on the core detail instead of the faint tail. Click on the image to see a zoom on the core area of the comet where some detail is visible then click again to return to the original image. Click here to see an image of the comet from a few days ago. This image was processed entirely in Images Plus 6.0. Calibration done in Images Plus without darks using the hot /cold pixel correction capability of the software. The image was then stacked twice, once using a median combine stacked on the comet and the second time using the standard auto processing with a median combine. The first stack suppresses the stars and the second the comet. Next, the comet only image was stretched using a digital development processing and multi scale decomposition was used to bring out the core detail. The feature mask was used to completely remove the comet from the star image. Finally the two images were recombined using a lighten blend mode with the star layer on the top of the stack.